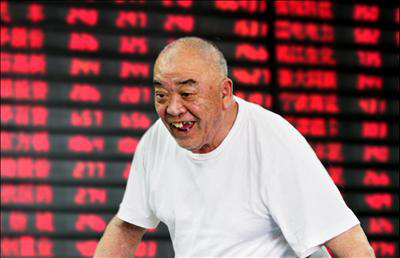 On May 13th, the Shanghai Stock Exchange Composite Index (SSEC) for the first time crossed the 4000 level. In just this February, when the index crossed the 3000 level for the first time, it promptly dropped 9%, causing a worldwide correction in stock prices. Who would have thought, in the short 3 months that followed, it would have crossed another milestone. Miracle stories abound as well. There are the usual overnight success stories of somebody (names published in newspaper) who made over a million dollar in one day. There are even stories of chronically sick patients who recovered after winning big in the market. These anecdotal stories of mania are worrisome enough, they are further corroborated by the unsustainable high average P/E ratio of over 50 in the Chinese stock market. That’s why I see dark clouds gathering even while many people still see green. Stock market crashes of significant magnitude (> 40%) are never caused by economic problems alone, they are usually preceded by a period of unbridled optimism. The optimism in China now is at a hysterical level and it is unlikely to abate leading up to the 2008 Olympics. What I am afraid will happen is that after the 2008 Olympics or shortly before that, smart money will exit the market. A massive exit could trigger a run in the Chinese market that would spread globally. What can we in the US do about it? First, don’t panic. The ship that is the US financial system is very solid and resilient, storms (even one coming out of China) will shake it but will not sink it. Second, it would be prudent to raise the cash level of your investment leading up to the Olympics. In case you don’t know, the opening ceremony will be on 8/8/2008, still 445 days away. Third, it is wise to invest in defensive stocks. As a matter of fact, it is always wise to invest passively.